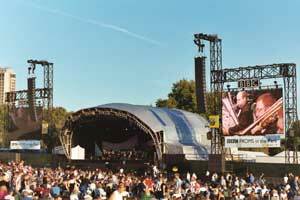 Martin Audio this year provided the main loudspeaker systems for BBC Proms in the Park and CBBC Prom in the Park via long-term PA providers to the event, System Sound. This is the eighth year of the event, and System Sound originally became involved through Andy Ayres’ Mantaplan, one of the event production companies. This year, nearly 40,000 people assembled in Hyde Park, while other venues staging an afternon ‘prom’ were Donegal Square, Belfast, Pacific Quay, Glasgow and Singleton Park, Swansea, before taking a relay link in traditional fashion with the Royal Albert Hall, for The Last Night Of The Proms. This year’s stars included bass-baritone Bryn Terfel, musical star Ruthie Henshall and pianist Jean-Yves Thibaudet. They led the celebrity line-up joining the BBC Concert Orchestra under Robin Stapleton for the main part of the evening’s entertainment in Hyde Park, hosted again by Terry Wogan. Also headlining was jazz musician Jamie Cullum, who was recently awarded the 'Rising Star' prize at the BBC's Jazz Awards. Each side of the main Left/Right system covered the first 130 metres, and comprised of four W8LS Line Array subwoofers and 12 W8L full range Line Array cabinets — flown in a common column and augmented by a ground stack of eight WSX horn-loaded subwoofers. Eight Martin Audio Blackline Series F12 loudspeakers, provided by Limit Audio, were mounted on poles along the stage apron for front fills, while Capital Sound Hire loaned three Martin Audio WSX and Crown amplifiers. Four towers of four W8LC Compact Line Arrays were placed on a 110-metreradius from the stage to extend line array coverage beyond the first row of conventional delay loudspeakers at 160 metres. Martin Audio’s ViewPoint software was used to design the W8L/W8LS main columns and the W8LC delay systems. The W8L’s and W8LS’s were powered with Martin Audio MA4.2S power amplifiers while the W8LC’s and F12’s were powered with Martin Audio MA2.8S amps. The WSXs’ were powered with a combination of Martin Audio MA4.2S power amplifiers and Crown MA3600 amplifiers. System controllers were a combination of Martin Audio DX1s and XTA DP226s. The following day the W8L system remained in the park to service the CBBC Prom In the Park event, which headlined Busted, Mis-Teeq, Big Brovaz and Target. The two-day event was engineered by Richard Sharratt on a pair of DiGiCo D5 desks and system tech was Stewart Chaney. The PA company sent most of the feeds to the BBC OB truck including a strings sub-mix on a Yamaha DM2000.